Nigeria is one of the most open services markets in Africa, receiving an overall rated score of 27.1 (virtually open) on the Services Trade Restrictions Index (STRI) published by the World Bank. The Nigerian services sector has remained resilient amidst hard-hitting economic circumstances. The strength of the sector has hinged on its consumer-facing nature which have seen it grow into a significant economic force. Over the last decade, the sector has met pent-up consumer demand and served a fast-growing middle class. Buoyed by government policies and increased private investments, growth in the sector has driven the diversification of the economy. 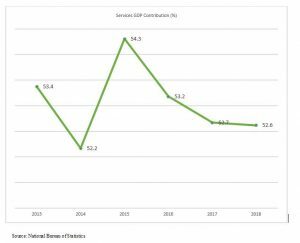 Services currently accounts for 53% of the Nigeria’s gross domestic product (GDP). The top contributory services activities are trade (16%), information and communication (12%); real estate (6%); professional, scientific and technical services (4%), and financial and insurance (3%). A growing generation of Nigerian consumers has seen wholesale and retail sales (trade) become the second largest sectoral contributor to Nigeria’s GDP. Trade accounted for 16.4% of Nigeria’s GDP in 2018 with an estimated market size of US$109 billion.The informal market is the primary outlet for most products, and is geared towards the lower-income segment of the population. Formal retail, an emerging sub-sector in Nigeria, accounts for roughly 5% of the entire market. Nigeria ranks as the eighth most attractive investment market for retailers in Sub-Saharan Africa and twenty-seventh globally, largely based on its volume of consumers and its growing middle class. In this wise, it has attracted a wide range of foreign investors, including South Africa’s Shoprite, the continent’s largest supermarket chain, SPAR, the Dutch retailer, and Pick n Pay, another South African retail giant who is partnership with a local chain-store operator, AG Leventis & Co. This development is complemented by a host of domestic private investors who are building a chain of retail stores across the country.The e-commerce retail segment is growing at about 110% per annum and worth over US$12 billion. The prospects of the market segment are particularly strong with 49% of the population being internet-savvy. Nigeria has the largest online market for apparel and footwear in Africa; it is expected to grow from US$104 million in 2014 to $1billion in 2019. Homegrown online retailing outlets, Jumia.com and Konga.com (which offer services similar to Amazon.com) are leading the growth of this market segment. These domestic companies allow for cash-on-delivery payment, which caters to the still largely cash-based consumer base in Nigeria. 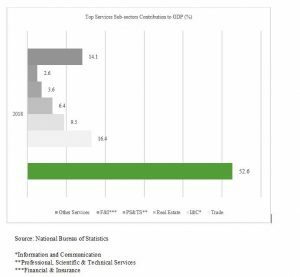 The information and communication sub-sector contributed 12% in 2018 and has grown at about 4% over the last 5 years. Nigeria is home to the fastest growing and largest telecommunications industry in Africa. The industry has grown phenomenally from a very low tele-density of 1.89% in 1993 to a magnificent 124.29% in 2018 contributing an annual average of 9% to the national GDP and about 80% of the IC segment of the economy.With a population size of about 200 million, less than 60% of whom are active internet users, the information, communications and technology (ICT) industry presents attractive investment opportunities. Through various electronic platforms, Nigeria’s ICT network has revolutionized business transactions by providing the highly mobile-technology-driven population seamless ability to bank, invest, purchase, distribute, communicate, and explore anytime and anywhere access to the internet is available. Following wide and far-reaching reforms, the Nigerian financial and insurance industry has steadily evolved into a more diversified, stronger and more reliable industry equipped to stimulate and support economic growth and sustainable industrial development of the country. The industry contributes about 3% to Nigeria’s GDP.Nigeria has integrated electronic payments into its financial system, a step that has reduced the flow of physical cash in the economy and is gradually transforming the country into a cashless environment. Wholesale & retail industry: The industry provides opportunity for establishment of chain stores. Financial & insurance industry: With such a rapidly diversifying economy and strong entrepreneurial spirit, Nigeria’s financial services sector is wide open for investors wishing to invest in deposit money banking, micro finance banking, mortgage banking, general and industrial insurance, and stock market. Telecommunications: The industry is open to investors wishing to provide and operate private network links employing cable, radio communications, data services, internet business and satellite communication, payphone services and cellular radio phone services. Government has deliberately designed investment incentives to support private sector participation in the sector. 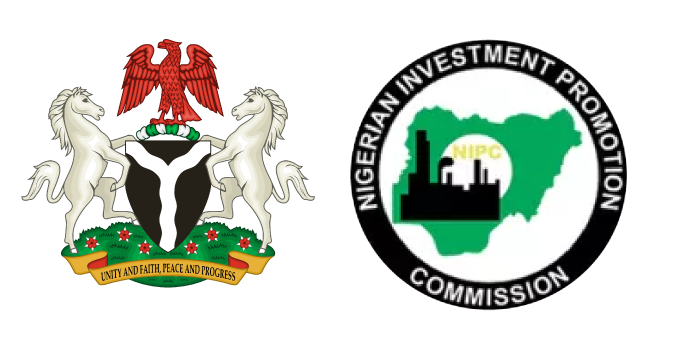 For information, please access the Compendium of Investment Incentives in Nigeria. Large and competitive market with huge and unmet demand. A growing and increasingly sophisticated middle class with tech-savvy young adults. An entrepreneurial population with innovative, creative and highly resilient.